Evan has a classmate who has been ill and away from school. Evan talks about him a lot. He's been concerned about the boy, talking about him, asking us to pray for him and asking me to ask his mum about him. At the end of the day, Evan's really sweet and empathetic and we love him for that. Anyway, I've been in touch with the boy's mum and the boy's been feeling very isolated. His world has been reduced to the hospital ward and he's weak from a lot of the treatment. As a result, he's been feeling very down. Plus he can't have visitors. So, I asked Evan to be his pen-pal. 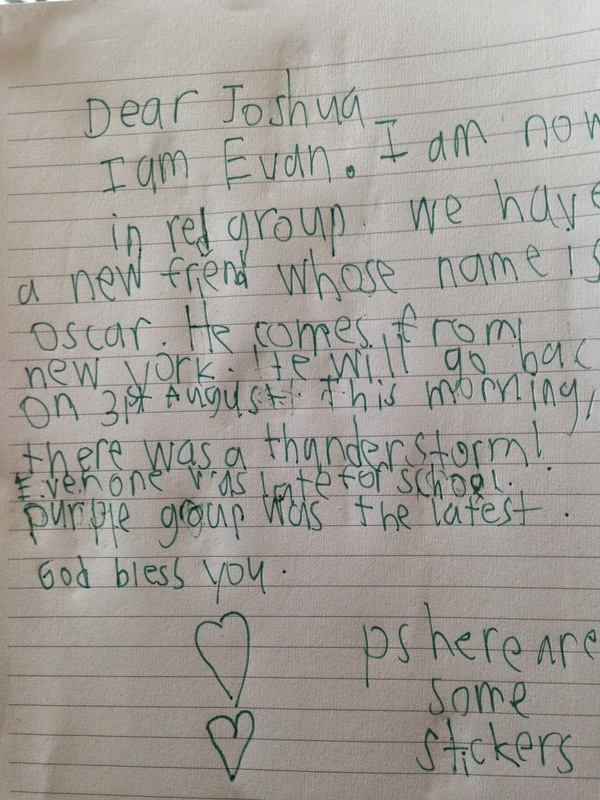 Not surprisingly, Evan had no idea what or who a pen-pal was. We explained it to him and while the intention was always there, we were always too busy to write to the boy. Then, a very close friend posted this on Facebook. "Talking about growing up in #Singapore in the 80s ; the 20ish journalist asks, "So how did that whole penpal thing work?" #feelingmyage"
And that got me thinking that JED would grow up the same. They wouldn't know use pen and paper to write letters, mail letters and wait for responses. I remember thrill was receiving something in the mail. The thrill is gone because much of what I receive are bills and I rather not open them. But for them, their bills still come to Mommy. So at this point, mail ought to be something fun for them. Eventually, we did get down to doing it. He put a lot of effort into it and he wrote a letter which was full of information. It's also helped him feel a bit more at ease because he knows that he has done something that would make his friend feel a bit better. My hope is that they will keep this up for a while. It'll help his friend establish some contact with people on the outside; it'll help teach Evan patience; he really hates writing and the only thing worse than that is long pieces of writing. And since they love listening to stories about what we used to do as children, this fit right in with it. Their fascination right now is that Mommy knew someone from Denmark and it wasn't The Little Mermaid.